A friend sent me this YouTube link of Chinese ballet-acrobats. 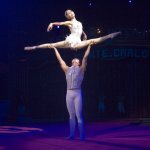 A man and woman perform a pas de deux at a circus convention. Inspiring flexibility and balance, to say the least. Hard to find words for this dedication.